The short version of the Austrian True Money Supply increased by 0.70% (44.02% annualised) during the most recent week ending 30 September to hit USD 9.5842 trillion calculated based on monetary statistics just released by FRED. 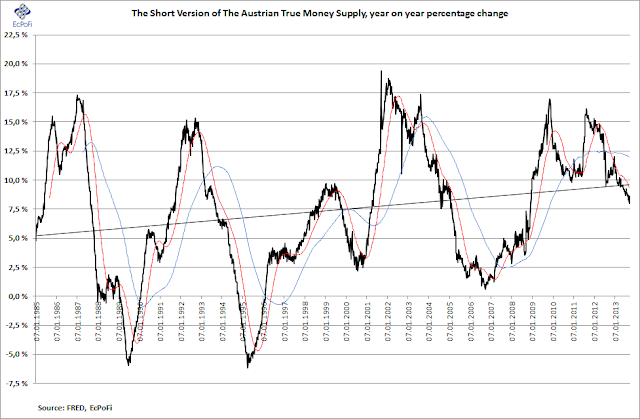 Following the increase last week, the 1-year growth rate in the money supply again declined, this time to 8.08%. Not including the 8.02% 1-year growth rate from two weeks ago, the current growth rate was the lowest since 8 December 2008. As the chart below shows, the growth rate has been heading downwards for most of this year. My point here is that this has been a fabulous year for US equities by most standards leaving the overall stock market, including the S&P 500 index, with less up-side potential. 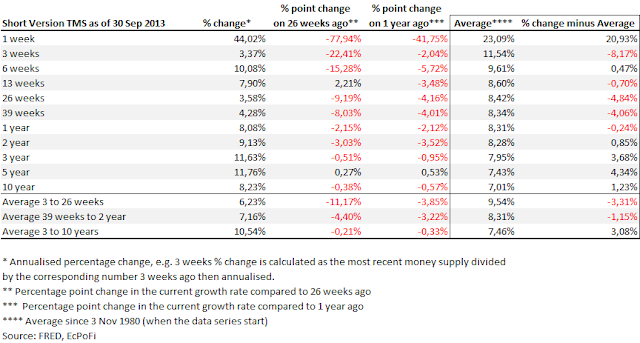 As the table below shows, most of the current growth rates in money supply are lower than they were both 26 weeks and 1 year ago. 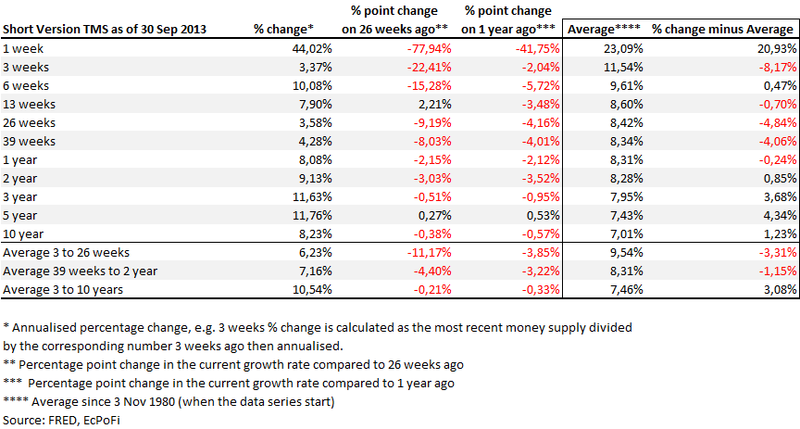 This highlights that the growth rates have been slowing down which could very well be bad news for the stock market. 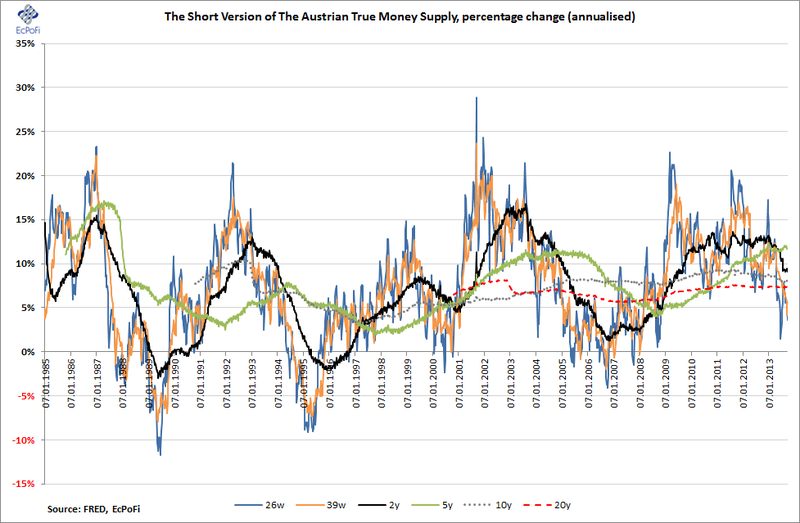 The decline in the growth rate of the money supply is partly driven by dismal growth in Bank Credit as I have written about in the bi-weekly U.S. Money, Credit & Treasuries Review (here's the most recent issue).